Matthew Apgar - mapgar@shawmedia.com Airman first class Ellie Lapi of Carpentersville (center) gives a tight hug to her sister, senior Emily Lapi (left), 18, as other sister, sophomore Erin Lapi, 16, wipes away tears during an emotional reunion at Harry D. Jacobs High School on Monday, Feb. 26, 2018 in Algonquin. Ellie Lapi is on a midtour leave from her station in South Korea and surprised her sisters during a lunch period at the school. 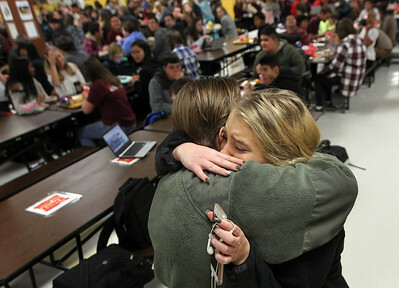 Matthew Apgar - mapgar@shawmedia.com Senior Emily Lapi (left), 18, and sophomore Erin Lapi, 16, react after seeing their sister, airman first class Ellie Lapi of Carpentersville, 19, during a surprise reunion in a lunch hour at Harry D. Jacobs High School on Monday, Feb. 26, 2018 in Algonquin. Ellie Lapi is on a midtour leave from her station in South Korea. Matthew Apgar - mapgar@shawmedia.com Airman first class Ellie Lapi of Carpentersville surprises her sisters, senior Emily Lapi, 18, and sophomore Erin Lapi, 16, with an emotional reunion at Harry D. Jacobs High School on Monday, Feb. 26, 2018 in Algonquin. Lapi is on a midtown leave from her station in South Korea. Airman first class Ellie Lapi of Carpentersville (center) gives a tight hug to her sister, senior Emily Lapi (left), 18, as other sister, sophomore Erin Lapi, 16, wipes away tears during an emotional reunion at Harry D. Jacobs High School on Monday, Feb. 26, 2018 in Algonquin. Ellie Lapi is on a midtour leave from her station in South Korea and surprised her sisters during a lunch period at the school.